The IRIS 9000 by ThinkGeek is a new companion to the iPhone 4S that merges speaker phone and Siri voice command functionality with a bit of spooky sci fi. This is intentionally done. The parallel that will be easily recognizable to science fiction fans is to the HAL 9000 of Stanley Kubrick’s 2001: A Space Odyssey fame. 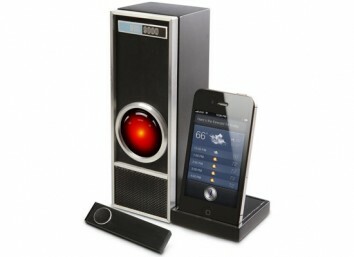 In basic terms the IRIS 9000 consists of a speaker and iPhone dock. The user places their iPhone into the dock allowing for an interface. A hand held remote is included with the unit and once the iPhone has been docked an individual presses the button once to give voice commands to the IRIS from a distance of up to 50 feet away. The speakers emit a chime to let the user know that it is ready to receive the voice commands. The IRIS 9000 responds to voice commands with a computerized voice of its own. Some users complain about the fact that this doesn’t sound more like the cool and personable yet unsettling voice of the HAL 9000 from the Kubrick movie, but other suggest that this may keep people from having nightmares. The computer voice is a fairly standard sounding female computerized voice that responds either with standardized responses such as reminders or with preprogrammed comments set up by the user. Thus there is a lot of room for humor in the use of the device. A somewhat ominous red eye that flickers when the device speaks is also a familiar feature that further references the movie. The voice commands activate the Siri personal assistant software installed on the iPhone. This software allows users to do a variety of things such as make phone calls, set appointments, send emails, and get reminders, all using natural language processing to process voice commands and make verbal responses. This is an innovative application included with the iPhone 4s. The IRIS 9000 speaker amplifies the Siri voice responses so they can be heard from anywhere in the room. IRIS is Siri spelled backwards, suggesting some kind of a reciprocal relationship between the technologies, the IRIS receiving, mirroring, and amplifying the Siri applications. The device also acts as an ordinary speaker phone. The user can make and receive calls without ever picking up their iPhone. Again, this is done from anywhere in the room by simply pressing the button on the remote and telling the device to make the phone call or to answer. The sensitive microphone allows the individual to be heard as they go about various tasks in the room in which the device is situated. This device is clearly designed to appeal to people with futuristic sensibilities. It caters not only to sci fi buffs but to the average user who would like to be able to talk to a virtual assistant who will obey their every command most dutifully and pleasantly. Then again, there is always some fun in having the device give back an unexpected or even challenging response, and this can be arranged as well. This gadget is fulfilling a kind of fantasy of the cool and cooperative virtual assistant that has been cultivated in movies and television for quite some time. The IRIS 9000 is surprisingly affordable at around $60.00. This brings it into the range of easy affordability for most iPhone users. This device will be available early in 2012. That gives you time to save up a little bit of money as our economy and possibly your job situation continue to go through their surreal and unpredictable shifts. Yes indeed, folks, things are getting more high tech and futuristic just like the movies have forecasted, and the IRIS 9000 brings the feel of this to the average user with innovative technological integration and with style. Joe Will is a staffing agent, he helps businesses find new staff. He has worked in the recruitment industry and recommends to friends Adecco USA temporary staffing services for any staffing needs.